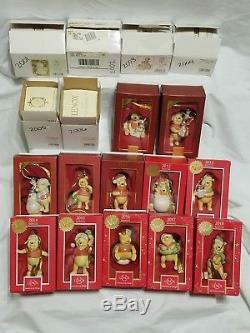 Complete Set of 18 Annual Lenox Winnie The Pooh Ornaments 2001 - 2018 Lot All In Original Boxes In Gently Used Condition. No Chips, Cracks, Or Repairs. All Gold Hang Cords Present And Intact. All Have Been Stored In Original. Boxes Have Minor Shelf Wear. Which May Include Store Sale Stickers. Earlier Ornament Boxes Have Year Written In Black. This is my PERSONAL Collection. All are Authentic and have been stored in their ORIGINAL Boxes. PLEASE DO NOT ASK FOR SET TO BE BROKEN UP! 24 Karat Gold Accents and Dates. All Include Original Boxes and COAs (Where Applicable). 2001 "A Honey of a Holiday" In Original Ivory Box (Year Written In Black) with COA. Features Winnie the Pooh and Piglet with a Honey Pot. 2002 "Sledding Friends" In Original Ivory Box (Year Written In Black) with COA. Features Winnie the Pooh and Piglet Riding On A Sled. 2003 "Pooh's Holiday Ride" In Original Ivory Box (Year Written In Black) with COA. Features Winnie the Pooh Riding On Eeyore. 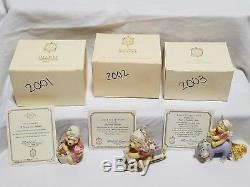 2004 "Presents From Pooh" In Original Ivory Box (Year Written In Black) with COA. 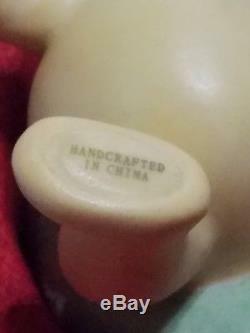 Features Winnie the Pooh Holding Gifts and a Honey Pot. 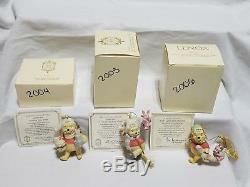 2005 "A Tree for Pooh and Piglet" In Original Ivory Box (Year Written In Black) with COA. Features Winnie the Pooh Carrying A Christmas Tree With Piglet Riding On The Back. 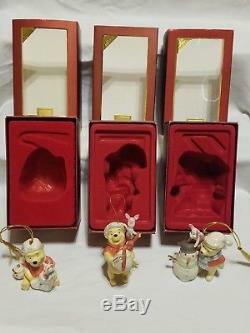 2006 "Pooh's Candy Cane Christmas" In Original Ivory Box (Year Written In Black) with COA. Features Winnie the Pooh Carrying A Large Candy Cane With Piglet Riding On The Back. 2007 "Stocking Surprise" In Red Box (COA Not Applicable). Features Winnie the Pooh With Piglet In A Stocking. 2008 "Perfect Present" In Red Box (COA Not Applicable). Features Winnie the Pooh With Piglet. 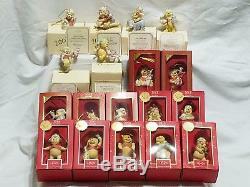 2009 "Pooh's Frosty Friends" In Red Box (COA Not Applicable). Features Winnie the Pooh With Piglet And A Snowman. 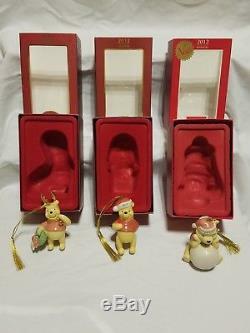 2010 "Pooh's Deerest Christmas" In Red Box (COA Not Applicable). Features Winnie the Pooh Wearing Reindeer Antlers and A Bell Holding A Wreath. 2011 "Pooh's Santa Surprise" In Red Box (COA Not Applicable). Features Winnie the Pooh Wearing A Santa Hat. 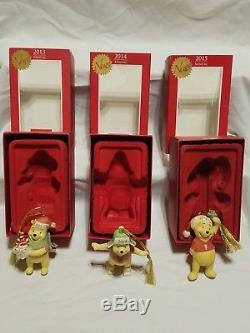 2012 "Pooh's Frosty Fun" In Red Box (COA Not Applicable). Features Winnie the Pooh With A Large Glittered Snowball. 2013 "Peppermints From Pooh" In Red Box (COA Not Applicable). Features Winnie the Pooh Holding A Honey Pot Filled With Candy Canes. 2014 "Playful Pooh" In Red Box (COA Not Applicable). Features Winnie the Pooh Wearing Ice Skates. 2015 "Kiss Me, Pooh" In Red Box (COA Not Applicable). Features Winnie the Pooh Holding Mistletoe Above His Head. 2016 "Sledding Fun With Pooh" In Red Box (COA Not Applicable). Features Winnie the Pooh Sledding. 2017 "Hanging Around With Pooh" In Red Box (COA Not Applicable). Features Winnie the Pooh Hanging Through The Center Of A Wreath. 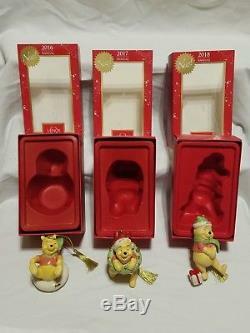 2018 "Presents From Pooh" In Red Box (COA Not Applicable). Features Winnie the Pooh With A Gift. Please Look at Pictures Carefully. Item(s) Shown Is What You Will Receive. Details about mimiandmikey store business practices. We do our best to provide several photos and an accurate description for each individual listing. A detail that you feel is important. Specific that you would like to know, which is not in the listing, please. We will answer all questions to the best of our ability. Additional photos and/or item specifics are always available upon request. Most of our listings have the option to submit a "Best Offer" below listing price. We review and respond to all offers received. Are Accepted and others may be Countered or Declined. We try to respond to all messages received within a reasonable time frame. We will do everything we can to resolve any problems. We ask that you give us the opportunity to work things out prior to escalating to a case. If you cannot find the tracking information, within. Encourage Buyers to utilize the free tracking updates available on the carrier websites. 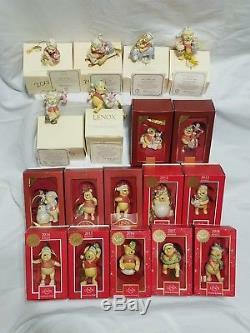 The item "Complete Set 18 Annual Lenox Winnie The Pooh Ornaments 2001 2018 Lot In Boxes" is in sale since Thursday, November 15, 2018. 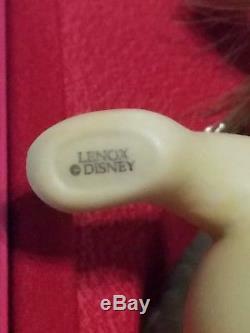 This item is in the category "Collectibles\Decorative Collectibles\Decorative Collectible Brands\Lenox\Ornaments". The seller is "mimiandmikey" and is located in Gilbert, Arizona. This item can be shipped to United States.